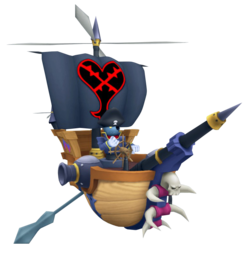 Heartless that fused together with a pirate ship. They attack with homing and magic projectiles. Attack them at close range. The Battleship is an Emblem Heartless that is found in Kingdom Hearts. Battleships are large galleon-like Heartless that fly in the air via propeller. What looks to be a Heartless captain on it is actually its head and top half of its body. One of the most complicated Heartless, Battleships seem to be composed of two main parts. At the wheel of the ship is a Heartless captain, blue in color and wearing an eyepatch, black pirate hat with a skull on the headband, white gloves, and a blue admiral's jacket with red and gold trim. The ship itself is a bit more ornate; while made of what appears to be ordinary wood, it is decorated in bright pink and purple and features a prow covered in horns, a skull figurehead, and a cannon with a sharp spike as ammo at the very front. On the left hand side, just behind the prow, is the ship's spiky anchor. Two smaller cannons sit on either side of the ship further back. Although the ship appears to be powered by wind, as seen from the black sails, giant propeller on the mast, and two smaller propellers on the stern, the ship also has two grey oars jutting from the sides. 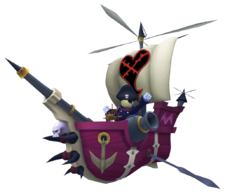 The Kingdom Hearts Final Mix recolor makes for a much wilder looking ship; it is now painted a bright pink color, the horns are black, and the trim and sails are white. The Battleship bears a slight resemblance to the Pirate Ship Gummi Heartless. The Battleship's name and design are references to battleships, notably ones used in the pre-nineteenth century. Like the Heartless, these ships had sails and used cannons as a main form of attack. Battleships are some of the most powerful non-boss type enemies in the game, and are in the same ranks as the Devastator enemy in Kingdom Hearts II. Certain parts on the Battleship can be destroyed, crippling it. For example, the cannons can be destroyed to halt its fire or the sail can be destroyed to cripple its maneuverability. Sora doesn't have to destroy all the parts to defeat a Battleship, but he does get tech points. The Battleship may appear to charge up and has a purple aura resembling a shield at the nose and charges into Sora. It may also fire balls of energy upward that home in on him. It will also raise up above his view and start to drop bombs on him. These attacks don't cause major damage, but may be deadly if Sora is low on health.